SHOE CARNIVAL: Shoe Carnival in Willow Grove is having a VIP special this weekend from Dec. 21 to Dec. 23, where you can buy one get one 1/2 off + 15% off. Just mention Overlook Elementary at the register. The coupon is posted on the Overlook PTO Facebook page. If you have questions about this, email board@overlookvolunteers.com. They are also offering Overlook PTO 10% of proceeds on all sales all year long when Overlook is mentioned at the register. 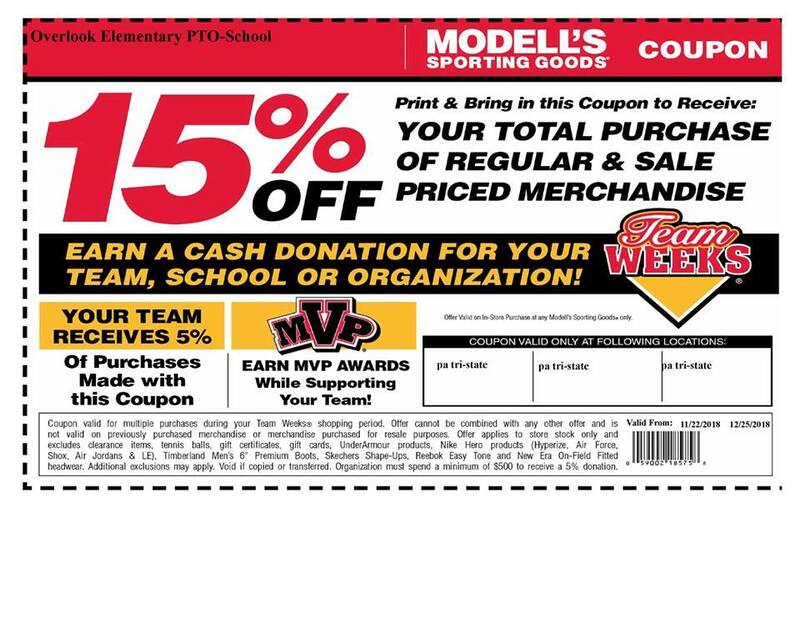 MODELL’S COUPON: If your holiday shopping needs involve sporting goods, don’t forget about this great offer from Modell’s this year. Use this coupon & get 15% off your order. If we spend at least $500 as a school, we get 5% back. This offer runs until December 25th. MIXED BAG DESIGN: It’s not too late to order. You can still order online through December 31st. Order at mixedbagdesigns.com Fundraiser Id #826003. SPIRIT WEAR: Overlook’s 2018 Spirit Wear sale has begun and will run all year. Order at: https://overlookspiritwear2018.itemorder.com. Orders will be processed on the 1st and 30th of every month and will be fulfilled 3 weeks after store closing date. Questions: Contact Laura S. at spiritwear@overlookvolunteers.com. BOX TOPS: We earned $500 in rewards from our first collection of Box Tops. Please continue to clip and send them in with your child, labeled with Student Name and Teacher. There is also a Box Tops Bonus App, an amazing app that you can download. You select what you bought, take a picture of your receipt and submit. Only specific items are available through the app so make sure you check it before you shop!! Posted on December 17, 2018 by OverlookElem	• This entry was posted in Uncategorized. Bookmark the permalink.